The new Quench Artspace in Waitsfield has the polished look of many urban contemporary galleries: cement floors, plenty of light and fresh white walls to showcase the art. At a recent opening reception for its inaugural exhibition, visitors are greeted by the soft sounds of a jazz combo and then treated to food and wine courtesy of Moretown’s Fiddleheads Cuisine. Quench owner Peter Nielsen takes it all in. Just weeks ago, he was still cleaning mud off the floors — the stubborn residue from Tropical Storm Irene floodwater, which at its peak had reached the ceiling. Now the space is pristine, brought to life with the graffiti-inspired paintings of Middlesex artist Galen Cheney; the iconographic paintings of Alison Goodwin, Nielsen’s wife; and Montpelier artist Brian Zeigler’s graphic narratives constructed from black-and-white collaged drawings. Quench aims to showcase the work of contemporary visual artists from Vermont and beyond, as well as host performances and creative projects of all kinds. But Nielsen has a broader vision for Waitsfield: to revitalize the flood-ravaged town by branding the village as an arts district. Nielsen’s marketing firm, HigherMind MediaWorks, is on the second floor of the Quench building. Drawn by Waitsfield’s vibrancy and community spirit, he launched his company at the corner of Main and Bridge streets last July. One month later, Irene laid waste to the commercial heart of the village, including the newly renovated basement of the building he occupies. Izabel urged her dad to do something to “bring Bridge Street back,” he says. Why not turn the basement into a public art space? Initially, Nielsen said no; he didn’t want to start a new project while trying to get his business off the ground. It’s not that Nielsen was a stranger to artistic ventures. He was instrumental in developing First Night Montpelier and managing the band Bluegrass Gospel Project. But he never could have imagined being the director of a fledgling contemporary art venue, he says, let alone becoming a cheerleader for the creation of an entire arts district. 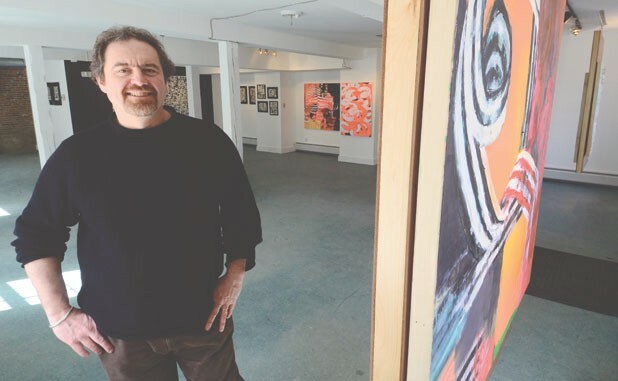 Then, in early February, while driving back home to Vermont from a business trip, Nielsen received a phone call from Norman Abend, the owner of the Bridge Street building, asking if he would be interested in opening a gallery in the once-flooded space. Abend and his wife, Sydney, also own the building next door, which is home to the Artisans’ Gallery of Vermont. As he had with his daughter, Nielsen once again declined, but Abend wouldn’t give up, suggesting he would come to Vermont from his Massachusetts home to discuss the idea in person. Nielsen says he was moved that the 80-year-old Abend was so impassioned about the project that he would drive three hours to talk about it. Still, he was reluctant to set up an art venue in a basement. “If I considered opening a gallery at all, I would want to do it right,” he says. Using his own marketing company, Nielsen plans to brand the entire neighborhood as a “revitalization project and contemporary art project.” He believes the area has potential to become an arts district because of existing cultural venues, such as architect Dave Sellers’ Madsonian Museum of Industrial Design across the street. Nielsen and friends are using a Kickstarter campaign to raise $10,000 to fund future Quench projects, among them a fashion show with jewelry designer Sheri DeFlavio, owner of 4orty Bridge Boutique.